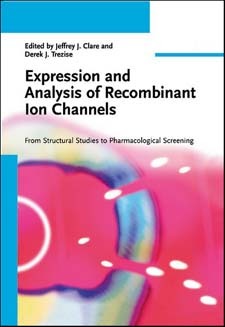 Expression and Analysis of Recombinant Ion Channels is directed at both the new and the experienced researcher wishing to learn more about the considerations and methods for studying recombinant ion channels. Advantages and Disadvantages of Xenopus Oocytes. Generation of Chimeric Channel cDNAs. Epitope-tagged Channels and Fusion Partners. Unnatural Amino Acid Mutagenesis Methodology. Unnatural Amino Acid Mutagenesis for Ion Channel Studies. Choice of Host Cell Background. Post-translational Processing of Heterologous Expressed Ion Channels. Expression Systems and Related Recording Techniques. Overview of Planar Array Recording. Overall Success Rates and Throughput. Fluorescence Assays for Ion Channels. Expression of Membrane Proteins for Structural Studies. Generation of First Diffraction Datasets. Selenomethionine Phasing of Membrane Proteins. MAD Phasing and Edge Scanning.